This was misinterpreted by some people as being an agreed policy. In reality the Wielkopolska government meet to discuss budgets on Monday 30th November. It should be remembered that 11th hour negotiations are taking place between regional government and PKP Cargo. It should also be noted that the new timetable is currently being printed with the steam services in. In making any decisions on changes in status of Wolsztyn depot the following facts have to be considered. Currently there are no available railcars to cover the Wolsztyn – Poznan steam diagrams and an acute shortage of suitable diesel locos within all the operating companies to operate passenger trains in the winter months. What would PKP Cargo do with the depot if it did not have full time work? The reason that tourists come to see the steam operation is based on the fact that it is the last steam commuter service in the world. Steam locos require servicing on a time scale rather than on operating use; the operating costs are not proportional to useage and by changing to a steam tourist service there may not be as greater saving as anticipated, when all costs and benifits are taken into consideration by all parties involved. The Wolsztyn Experience currently pay PKP (All Divisions) 250 Thousand PLN a year; this would most likely cease if the current operation changes. In addition, the Wolsztyn Experience and our clients bring to the local community another 500 Thousand PLN a year, this may also cease. In addition railway tourists not involved with the Wolsztyn Experience who come to see the last commuter service in the world bring an estimated 500 Thousand PLN a year. This would radically reduce if it became only a tourist railway. The Wolsztyn Experiece is confident that a solution to the current situation will be found within the next two weeks. Polish administrators should take into consideration that the success of tourist railways in the UK is down to UK charity tax laws – vast donations from enthusiasts – lottery funding – considerable UK marketing skills – and a large percentage of volunteer labour – none of these are currently available in Poland. Tourist lines in Britain view the scheduled services from Wolsztyn as the ultimate world experience for steam, and with the appropriate marketing could attract many more visitors and travellers than it currently does. The Wolsztyn Experience itself spends 25 Thousand PLN on advertising and promotion, not only for footplate courses but in publicity encouraging tourism to Wielkopolska. The Polish ambassador in the country you live in, e.g. At a recent meeting of the Wielkopolska provincial council’s Infrastructure Committee, councillors voted to end the 3 million zloty subsidy to Przewozy Regionalne, which operates the regular Wolsztyn – Poznan steam turns and instead to transfer the money to the Wielkopolska Tourism Organisation (WOT). Ironically one of WOT’s key projects is to develop railway tourism in Wielkopolska! These services were supposed to be an important element in promoting railway tourism. It turns out that they are not, and it all costs an enormous sum of money – claims Councilor Zbigniew Czerwinski. One of the deciding factors was the increased subsidy demanded by the operator to maintaining the steam services. Steam locomotives will not disappear, but will be hauling – hopefully on a regular basis – special trains throughout Wielkopolska – adds Czerwinski. Deputy Governor, Wojciech Jankowiak, disagrees with the decision. 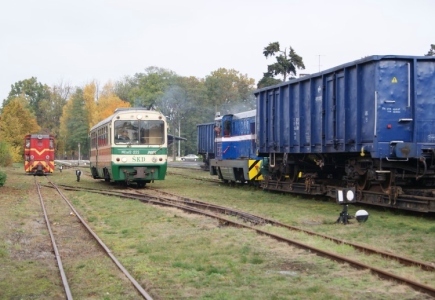 Removing steam haulage from the Wolsztyn – Poznan timetabled trains will mean the end of the roundhouse. He believes that organisational changes at Wolsztyn are needed, but does not have an easy solution. The end of Wolsztyn – Poznan regular steam working is not yet a foregone conclusion. The final decision regarding the funding needed to maintain the regular steam turns belongs to the Wielkopolska provincial council, and work on next year’s budget is still proceeding. Wojciech Lis, who works in the promotion department of Wolsztyn Town Council and is a committee member of the Society of Friends of Wolsztyn Shed, is shocked by Committee’s decision. He also believes that, if the decision is upheld by the main council meeting , it will be the beginning of the end of the Wolsztyn shed. He points out that in Western Europe there are many steam-hauled special trains, but only in Wolsztyn is possible to savour authentic steam-hauled trains in regular main line service. This attracts tourists from all around the world . Wojciech Lis has not lost hope that the timetabled services can be saved. On Wednesday, the national feastday of railwaymen in Poland, Witold Wojtkowiak – the Wolsztyn shedmaster said that the new timetable, which enters into force on 13 December, still shows daily steam trains from Wolsztyn to Poznan and back and return. The trains even appear on the DB railway timetable. The Wielkopolska provincial government meet to discuss budgets on Monday 30th November. There is still time to overturn the committee’s decision. 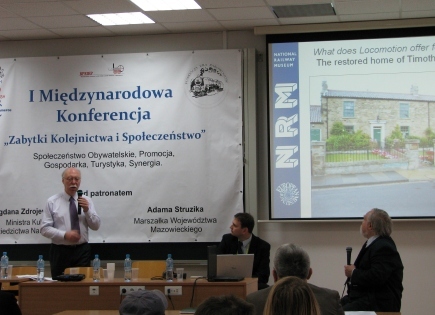 Andrew Scott, the Director of the National Railway Museum, speaking in Warsaw at the First International Conference on Railway Heritage and Society. A distinguished group of railway heritage experts from many many different countries in Europe attended Poland’s First International Conference on Railway Heritage and Society which took place in the Warsaw Management College on 26 November. The Conference consisted of three sessions. The first session was entitled, The preservation and promotion of railway heritage – Future possibilities, best practice solutions, social benefits, synergy. The keynote presentation, Public Benefits and Railway Heritage, was given by Andrew Scott, the Director of the National Railway Museum in York. Mr Scott explained how the NRM developed a new satellite museum in Shildon called Locomotion. By aligning some of the NRM’s problems (vehicles rotting in the open, no room for them in York, no money for more covered accommodation) with some of Shildon’s problems (high unemployment, low economic activity, low self respect) a brand new £10 million museum was funded with money coming in from the City, the Region and the EU. During this session Zbigniew Marciniak, from PKP Cargo outlined how it had been possible to retain steam-hauled trains on two of the daily Wolsztyn-Poznan turns; Jiri Kubaczek, Head of the Museum and Documentation Centre in the Slovak State Railways Research and Development Institute, explained how steam trains in the Slovak republic were kept running thanks to volunteer run railway societies; Mike Pease, founder of the British – Polish Railway and Industrial Heritage Partnership (BPRIHP) outlined how a family’s purse strings are controlled by ‘Mama’ and what she is looking for when planning a days outing for her family. Jacek Jerczynski outlined some of amazing achievements of the Wroclaw Railway Enthusiasts Society who had restored a number of items of rolling stock without any external funding whatsoever. Gordon Rushton giving his presentation. Robert Dylewski of Fundacja Era Parowozow is controlling the projection of the slides. The second session was entitled, Problems and disasters – Specific problems, barriers, threats. This was opened by former Ffestiniog Railway General Manager, Gordon Rushton and was entitled Money Talks. Mr Rushton outlined some of the ways how – 55 years after the line’s closure – the Ffestiniog Railway had gone about raising £25 to restore the Welsh Highland Railway. He also explained how understanding the impact of a heritage railway on the local economy is a useful lever to getting all the key players on side. Finally, he outlined the results of a specific economic impact study carried out by Bangor University into the effect of the Ffestiniog Railway upon the local economy. From left to right: Jaroslaw Lipinski, the chairman of the Polish Federation of Museum, Tourist and Local Railways; David Morgan, the president of Fedcrail and the chairman of the Heritage Railway Association; Robert Dylewski of Fundacja Era Parowozów and Marek Cieselski, translating for Mr Morgan. The afternoon’s proceedings were introduced by Martin Oxley, the Chairman of the British – Polish Chamber of Commerce who stressed the role that railway heritage could play in the development of Poland’s tourism industry. Mr Oxley stressed the need for cooperation and partnership with public and private bodies in order to secure the future of Poland’s railway heritage. The third and final session was chaired by Jaroslaw Lipinski, the chairman of the newly constituted Polish Federation of Museum, Tourist and Local Railways. The session was entitled, Analysis and solutions – Fast-track problem-solving, law and regulations, inter-departmental working group, national umbrella body, further action. The session was opened by David Morgan, President of Fedecrail and Chairman of the Heritage Railway Association. Mr Morgan urged all Polish organisations involved in railway preservation to join the new Federation, as only if it achieves critical mass will it have the resources and credibility to push back the barriers and threats facing Polish railway heritage. 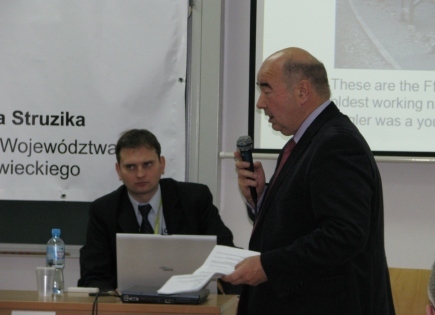 During this session, Pawel Niemczuk, vice chairman of the Federation and a board member of the Upper Silesia Railway Society, outlined some of the difficulties that the Federation’s founders had faced in finding a form of constitution which would allow all the different kinds of legal entities which operate in the Polish railway heritage field to become members of the new body. Other speakers included: Pawel Mieroslawski, the chairman of the Polish Railway Enthusiasts’ Association (PSMK), who outlined some of the current difficulties facing Polish Railway Heritage Projects; Zbigniew Jakubina, the chairman of the Pyskowice Railway Preservation and Railway Museum Management Society, who outlined the current difficulties his society faced with respect to their occupation of the railway land at Pyskowice; Miroslaw Szymanski, the chairman of Fundacja Era Parowozow – one of the organisers of the conference – who outlined his Foundation’s proposal to amend the law such that PKP railway land – such as the railway depot at Pyskowice – could be transferred directly to a railway society, rather than the process having to take place through an initial transfer to a local authority. Howard Jones of the Wolsztyn Experience, spoke about how the Smigiel Town Council had turned down a proposal from a British Railway Enthusiasts to restore the derelict Px48 at Smigiel to working order and Tomasz Strapagiel from the Local Rail Haulage Association, stressed the need to get local authorities on side and how this was often a long and painful process. At the end of the conference Mr Szymanski, proposed a resolution urging that the Ministry of Culture and National Heritage set up an inter-departmental working party to assist in removing some of the threats and barriers faced by organisations seeking to safeguard the future of Polish railway heritage. Andrew Goltz, the chairman of the BPRIHP who had taken on the role of Conference Director, thanked all those who had contributed to the success of the conference and put Mr Szymanski’s resolution to the vote. This was carried overwhelmingly with only one vote cast against. In the evening, conference VIPs – who included representatives of Polish ministries, provincial governments, other local governments and PKP as well as Heimo Echensperger, the chairman of the Verband Deutscher Museums- und Touristikbahnen (the German umbrella body for railway preservation societies) and Rik Degruyter, the vice-chairman of Febelrail, the Belgian umbrella body enjoyed cocktails served at the British ambassador’s courtesy Mr Paul Fox, the deputy British ambassador. Shunting in the snow at Smigiel. A still from a video by bosz112. It’s a strange paradox that, the harder I work at trying to do something about the mess that Polish heritage railways find themselves in, the less time I have to post to BTWT. This week has been particularly hectic. I promise to return to a more normal frequency of posting next week. In the meantime, here is something to celebrate the survival of the Smigiel Railway as a real working railway. A good friend sent me a link to this brilliant video of the Smigiel Railway which I am sure many readers will enjoy. Just a gentle reminder, if you are one of our campaigners who wrote to the Mayor of Smigiel asking him to do all he can to keep the Smigiel Railway running as a real working railway, perhaps now is the time to drop him a note of thanks for negotiating an agreement that will allow SKPL to continue running the line? After yesterday’s lapse in standards, today’s picture brings us back to the Polish narrow gauge. Stefan Morz recently posted a wonderful description of tracking a train on the Nowy Dwor Gdanski to Malbork section of the Zulawy Narrow Gauge Railway in June 1991. For those who are not fluent in German, here his story in an English translation courtesy of Google translate. Sadly this section of line no longer exists. It was closed by an unimaginative local authority several years ago to make way for road widening. Happily some of the Zulawy system still lives on rescued from oblivion and operated by the Pomeranian Railway Enthusiasts Society. Great! I thought, as the e-mail from the Railway Museum in Warsaw landed with a virtual thud in my ‘In’ box. It’s good to see that the Museum is fighting back. …we will be opening a new exhibition. We would be delighted if you would join us for the preview. Attendance is by invitation only. We would be pleased to see you there. Wonderful! Perhaps a new gallery devoted to the history of Polish narrow gauge railways and the role they played in the rebirth of the nation? Clicking on the enclosure that came with the e-mail revealed the picture above, the cover to an invitation to view the finalists of the Miss Steam Engine World competition and to watch a fashion show showing the designs of Sylwia Snoch. I must admit to a twinge of disappointment. I like my vodka and my steam engines neat. I would no more dream of mixing Zubrowka with Coke than of draping scantily clad schoolgirls over a Bulleid pacific. But who is to say that I am right? As the chaps from Fedecrail never tire of saying, Polish problems need Polish solutions. Credit where credit is due, Ferdynand Ruszczyc, the new director of the Railway Museum, is making a big effort to promote the Railway Museum. This is a massive improvement compared to the underground profile that the Museum maintained under his predecessor. Talking of Fedecrail, a new Polish umbrella body, the Polish Federation Of Museum, Tourist and Local Railways (PFKMTL), was formed on 21 October and at the Fedcrail meeting in Budapest on 14 November was admitted as a member of the European federation. So far only four Polish societies have joined: Pomorskie Towarzystwo Milosnikow Kolei Zelaznych (Zulaw Narrow Gauge Railway), Stowarzyszenie Gornoslaskich Kolei Dojazdowych (Upper Silesia Marrow Gauge Railway & Starachowice Narrow Gauge Railway), Towarzystwo Milosnikow Koszalinskiej Waskotorowki (Koszalin Narrow Gauge Railway) and SKPL (Kalisz Railway, Smigiel Railway, Przeworsk Railway, Pleszew Railway and Srem-Czempin standard gauge line). Between them, the four societies operate 10 railways totalling some 200 km. It has taken some six years for the idea of a Polish umbrella body to become a reality, since David Morgan, the President of Fedcrail, first planted the seed at a railway heritage conference held 6 years ago in Warsaw. We wish the new body success with their campaigns and hope that other Polish railway societies will join the organisation in due course. SKPL winning the battle for the future of the Smigiel Railway, the Railway Museum promoting itself harder than ever before, a new umbrella body to fight the cause of Polish heritage railways – a fair wind is blowing at long last! Smigiel Railway in PKP days. Freight train from Wielichowo. Still from Video by Andrzej Mastalerz. The first train ran on the Smigiel Railway, then called the Schmiegeler Kreisbahn ran in 1900. The line was metre gauge and the first section had been built out from Stare Bojanowo eastwards towards Krzywin. These days the line is 750 mm gauge and runs westwards from Stare Bojanowo to Smigiel where most trains terminate. Each year a few chartered special trains run to the present western terminus of the line at Wielichowo. In 2010 the Smigiel Railway will be 110 years old. SKPL, the operators of the line, plan to celebrate the birthday in style inviting a number of visiting steam engines and running a narrow gauge plandampf as part of the festivities. If you are planning your rail trips for 2010 then I would recommend holding the week of 10 – 17 September in reserve. Three trains in operation at Smigiel. At a meeting of Smigiel Town Council yesterday, a resolution was passed confirming that the Council intends to make a donation each year towards the operating costs of the Smigiel Railway commensurate in size with the railway’s local tax liability to the Council. The resolution spells the end of earlier plans prepared by the Counil for the railway to be run as a pure ‘tourist railway’ by the Town Council’s own direct labour force. SKPL will continue to be line’s operator and to offer a mix of passenger and freight services as well as special services customised to passenger’s individual requirements. I would like to thank everybody who wrote individual letters to the Mayor of Smigiel asking that the railway be allowed to continue its role as a working railway. The Bieszczady Railway’s LAS 0-6-0T hauling a photographer’s special in 2006. 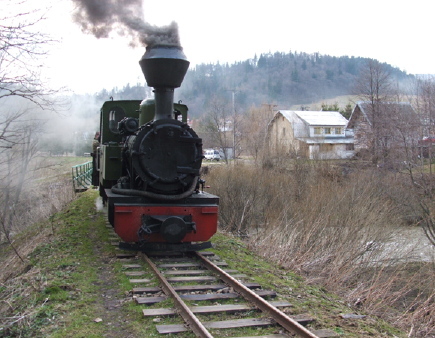 The Bieszczady Railway reports a good 2009 season. 115,000 tickets were sold to some 70,000 passengers. Currently the Bieszczady Railway operates over 30 km of a total of 70 km route miles. A three year modernization programme partly funded from the EU regional development funds has been given the go ahead from the provincial governor’s office. It is hoped to use the funds to refurbish the track and rolling stock and to restore the line’s Kp4 0-8-0T locomotive to working order. The only dark cloud is that the extension of the line to connect with the PKP standard gauge line at Lupkow has been put on ice for the time being. It is good news that, at a time when other narrow gauge railways are under pressure, Zygmunt Cholewinski the governor of the Podkarpackie province has recognized the value of economic tourism and has decided to back the scheme by providing the required ‘match funding’. Will 300,000 passengers lose their rail services? The PKP PR supervisory board meeting of 26 October. Photo PKP PR. A series of dramatic developments has brought PKP Przewozy Regionalne to the verge of bankruptcy and could mean the suspension of rail transport services for over 300,000 passengers who use the company’s rail services every day. PKP Przewozy Regionalne came to existance in October 2001 as part of a ‘reconstruction programme’ which split up PKP into some 200 individual companies on the British model. However, unlike great Britain, most of the companies were not privatised but stayed state-owned, either as daughter companies of PKP SA, or as companies where all the shares were directly owned by the State Treasury. Quite a few of the smaller companies – like the wagon building and repair works at Lapy – did not survive on their own and went into liquidation. PKP PR used to run 300 interregional and international semi-fast (pospieszny) trains, but on December 1, 2008 these trains were transferred to PKP PR’s then-sister company, PKP Intercity S.A. On December 22, 2008 the ownership of PKP PR itself was transferred to Poland’s 16 provincial governments. The local authorities accepted the gift somewhat reluctantly – PKP was a top-heavy bureaucratic monolith with a company culture that had not changed from the pre-1989 communist era. It is not difficult to deduce the intention behind the government’s transfer of local rail services to the provinces. In future, if the local authorities want local rail services they will have to pay for them. In fact most Polish local authorities were prepared to subsidize rail services, but bridled at the escalating demands of PKP PR and the lack of transparency regarding the way the company cash demands were calculated. A solution that was discussed many times was that each local authority should take over outright responsibility for running local authorities in its particular area. A number of provincial governments set up their own railway companies or held tenders for the supply of railway passenger services in their area. Presumably the process was taking too long for the government and this is why PKP PR was handed over to the local authorities at the end of the last year. With the company came a sizeable historic debt due to PKP PR’s former sister companies as well as responsibility for many loss making services. The first sign that things were going badly when Juliusz Englehardt, the Under Secretary of State responsible for Poland’s railways wrote to Poland’s wrote to Poland’s 16 provincial governors in August this year urging them to clear PKP PR’s outstanding debt to PKP InterCity. He also chided them for allowing PKP PR to run its Inter Regio long distance trains in competition with InterCity, but that is a different story. Last month a series of conflicting stories appeared in the Polish press: PKP PR was going to go bankrupt; the Government was going to make extra money available; no PKP PR was going to go bankrupt after all. Then came the news that Mr Engelhardt had ordered PKP InterCity to begin proceedings to recover the monies due to it, closely followed by the news that a court had seized control of PKP PR’s bank accounts. A meeting of PKP PR’s supervisory board meeting took place on 26 October at which a decision was made to instruct the company’s board to start proceedings for voluntary bankruptcy without delay. Such an arrangement would have enable PKP PR to enter arrangements with its creditors. There is just one problem there is no provision in Polish law for a company set up by an act of parliament – as PKP PR was – to go bankrupt. Without access to its bank accounts it can only be days before PKP PR is brought to a juddering halt. Who will blink first, Mr Engelhardt or the provincial governors? Watch this space.